I may keep the Jinbao or I might sell it. The two are *not* the same beast, and despite the Jinbao's resemblance to the 186 it is like having a completely different 4/4 CC. Even the wife agrees with this. So I will probably keep the Chinese tuba, too, since the resale value of the 410 is not very high. Is it particularly mouthpiece sensitive? What have you found to work the best? And now the thought of the day: Imagine if the Star Wars and Star Trek universes were joined and the Gungan (Jar Jar Binks' species) had been assimilated by the Borg. "Wesa da Borg. Gimme yous skeebeetle. Wesa gonna assimilate all-n yous peoples. Resistance isa nutsen." This is the best thing I've seen all week! Sweet! I'd like to strip my King to get it like this. Whoever had it before me lacquered over the nickel silver bits (!?!? ), but I'm leery of trashing it, so for now I'm living with leprous lacquer. Okay, so I have been working mostly on two other projects and have not had time for the Hilton for awhile, now. I had been putting off the next step because it was to tear down some stuff I was unhappy with, and the fit was very tight, so disassembly with a torch would be a major hassle for me. And yes, I had to bash up the end of my bottom bow, which literally made me sick to my stomach, and the large ferrule was slightly damaged, and I burned myself in four places. Anyway, I am a nut for details, and I know what I like and want, and getting that all the time is not easy. Being really picky means spending more money on parts and supplies and eating up more of my time. What can I say? I am slow. I do not do this for a living any more - haven't in more than a decade, actually. But I am careful and usually pretty meticulous; after all this crap I want to be happy with what I did. I do not want to sit there on a gig, staring at my horn during a tacet, and thinking, "You know, I really wish I had done a better job on [insert ridiculously minute detail] when I had this thing torn apart." That sort of thing makes me sick over many years and many tacet sheets. So one of my ideas with making the valve section removable is to be able to make a tool kit so that, in an emergency, I have everything I need to fully remove the valve section at a job site. I have had emergencies crop up on the road, 200 miles from home, that with a few simple tools could be fixed in a matter of an hour or less. So I want to carry this tiny tool kit in my bag with my supplies and such. I have to use some Yamaha sousaphone braces on this tuba, because they offer the smallest space between two tubes of the braces I can get commercially. Yes, I can make these from scratch - it is easy to do - but I do not have the needed nickel silver bars and sheets to make me happy. I *will* probably make my own on future projects, but for now I am using stuff I can buy. And this means I have braces from Getzen, Conn-Selmer and Yamaha. All these come apart using different tools, and this bugs me to distraction. So I altered the little Yamaha braces to use the same hex key as the King braces. I know, that was a waste of time and money, but IT MAKES ME SMILE and not much does that these days. So the Yamaha braces use a Japanese shaped Phillips head on a M3x.05 @ 6mm. I want socket-headed cap screws, so I bought some at the hardware store down the way. They are much better quality than the crap in the bins at Home Depot, by the way, and ONE FOURTH THE COST. I picked up 18 of these guys for the cost of four of them at HD. You get what you pay for, except when you don't. These fit the braces perfectly but were black oxide (read: Chinese black paint) and they used an M3 hex key. This need to carry another damned tool in my bag that could get lost irked me for a couple of days. I visited McMaster-Carr and found exactly what I wanted in a very high grade of stainless steel (think mouthpieces, surgical instruments, etc.) that won't allow the threads to strip out, the head to snap off or electrolysis to be much of an issue with the brass parts. The SS is of a higher quality than that used by Yamaha. PLUS - Yamaha Philips screws tend to deform so that the driver no longer fits if the factory guys installed them too tightly, which they do on some horns. (Or they used to back in the day. The screws in the braces of my 1983 YBB-641 gave up the ghost after three or four removal/installation rounds. I could never get them out again, eventually.) Part of the reason for this is the Japanese use a different shaped Philips head screwdriver. This is an issue today with electronics, but also with some cars. It just means that the drivers we use won't fit exactly right, and they slip out. The screws used by Yamaha are of a lower grade SS that is about a Grade 2 in hardness. (Normal for the automotive world is Grade 5, with Grade 8 being what gets used for off-road crawlers and such.) You can pretty easily crush a Grade 2 fastener with a 2 lb sledge. Anyway, the bolts I got from M-C are super hard and corrosion resistant (mil spec stuff that will suit my purposes quite nicely). I bought FIFTY of them for the same price as the 18 from the hardware store and the four from Home Depot. These are really nicely made, quality bolts, and they cost just about NOTHING in comparison to the Big Box. So, to get the 3/32" hex key to work I had only three sizes to choose from, two of which were too small. So I ended up getting 5-44x.25" and a very nice tap (better than Irwin/Hanson) for dirt. The only issue was the shipping. I wish those guys would just take tiny orders like this and put them in a padded envelope and ship them USPS-slow-as-heck stuff to save money. I *hate* it when the shipping costs more than the purchase. So my bargain ended up being about the same as my driving to Home Depot - no savings at all. BUT - I have *exactly* what I want now. Tonight I re-tapped the Yamaha brace bases and assembled these beauties. These are not strong braces as all the weight is on a post about 3mm thick and it is frequently in shear, so I am using five of them in one small area so that much of the brunt of carrying this tuba around is spread around lots of braces. 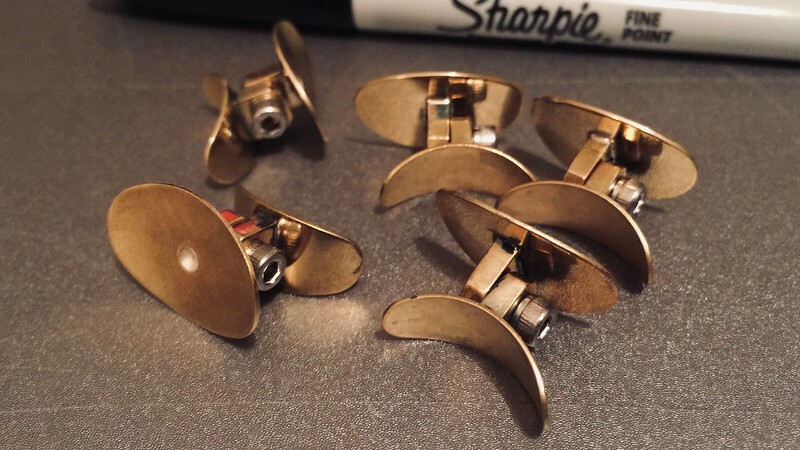 I had planned on using the same six it had before; comparing the weakest parts of each brace I decided to use no fewer than ten to hold the valves to the bugle. These are an original Yamaha brace kit and one with the same-fit, plain steel "black oxide coated" (yeah, right) Chinese socket headed cap screw from Home Depot. Here are the slightly larger (with with a slightly smaller hex key size that matches what I am already using) sooper-dooper bolts from McMaster-Carr. 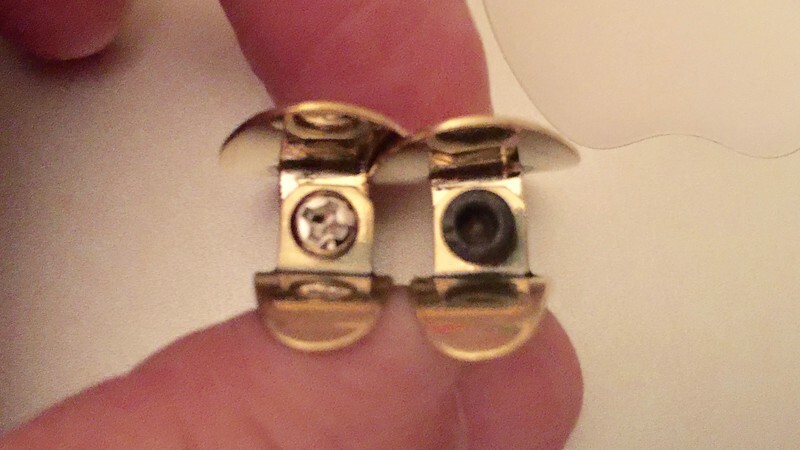 Of note: The Yamaha unthreaded half has holes that are too large and allow for a LOT of slop, which I don't want on my personal horn. These new bolts fit the unthreaded part very well, with nearly no noticeable horizontal play. Nice stuff. I have Japanese motorcycles and know all about the mutant Phillips head screws. SOP on Japanese bikes is to replace all of the fasteners with SS hex head fasteners. Hilton the Holton will be pretty nifty when it's done. What’s the latest? Any pics/video of the completed project? How did the braces work out? I had bungled something on the Holton and in disgust (and prudence) I put it away until I could start retraining myself on my Z60 dent machine. I had not needed to use it in like ten years so I was afraid to even try it on my precious Holton. I got my super cool 1971 186 CC and found that I had need of some Z60 work on it, as well. Tabor saved me by selling me a 1971 186 BBb for parts, and I have been working on the Z60 with it as my sacrificial metal. Things were going along quite well and I was very happy, and then Christmas season reared it ugly, dollar-studded head and I had to stop. Then January and February were busier than I can remember for the MSO and the freelance scene. Whatever, give my my money! All through March I have been very ill and hardly got out of bed, except to work. Things are back on an even keel again and my work schedule is letting up. I have like 13 more MSO performances or rehearsals and freelance gigs left for this season and then I have almost three months to get to work. The 186 project has blossomed into my trying to salvage the BBb parts horn by learning to silver solder all the holes and cracks rather than making patches — in addition to completely revamping the CC 186. Instead to stealing parts from the BBb to benefit the CC I am now using only new parts on the CC. All the old ones will be restored as possible and put onto the BBb when I cut it to CC. For fun. Because I can. Because I want to. Because it had been consigned to the scrap heap and I think I can turn it into a good practice tuba. Just because. I have been slowly gathering new parts. (Painfully so, to be honest, but this stuff costs a lot of money when a customer is not there to pay you when finished.) I have just about all I need for this stage. I will be getting more stuff later, but I can do some mighty satisfying work with what I now have in boxes in the shop. I have been out of acetylene for months, but I keep putting off picking up a new tank because I cannot do any work until the 18th. So on the 18th I will try to get back in the saddle. Once the CC 186 is done I can move on to some of the weird science-y stuff I have in mind for the BBb. And I can start to work out the blunder I perpetrated to my Holton's bottom bow. Once that has been fixed I have to remeasure everything because I think it will play pretty flat if I continue on this path. I need to reconsider some things — specifically how I plan to reassemble the horn. I am doing it wrong and I can see that now. If I was not reimagining so much at once I could just "paste" the valve section (with which I am supremely pleased) onto the bugle and make a new leadpipe. But I screwed with internal Bob Rusk sins that changed the taper. Tom Treece assures me that what I did will only improve the horn, but I have no way of telling whether I butchered a serviceable tuba in an attempt to make it structurally solid. In the process of doing all this I redesigned the 5th valve completely based on a wider MTS crook. Now the horn is longer. There are *very* few places left from which to trim length. So I am stressing over this tuba to the point of pretending it is not there whenever I have to step over or around it. It is effectively invisible for me at this time. Thank you for the update. We look forward to further pictures and text when you are ready to post!